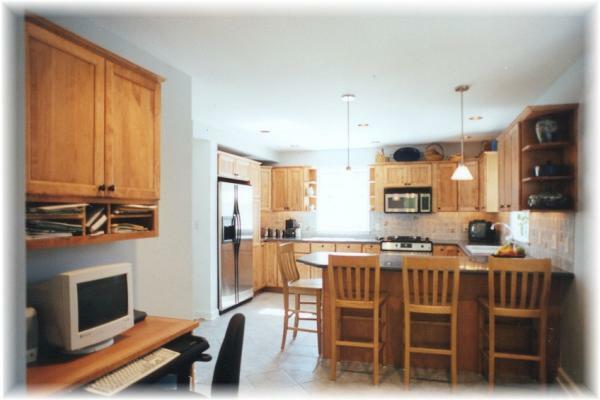 PROJECT DESCRIPTION: Complete remodeling of kitchen - Combine adjacent room and existing kitchen to create a spacious eat-in kitchen, including a small office area. Full demolition, heavy structural work, replacement & alteration of three windows and one fire door. All new sub floor, plumbing, heating, electrical & lighting, under cabinet lighting. Corian® countertop, tiled backsplash, ceramic floor tiles, extensive millwork. 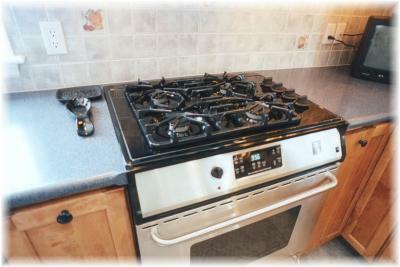 All new appliances from GE®. you made early on which allowed us to incorporate all the elements we wanted in our kitchen. Indeed, your vision was one of the reasons we hired Absolute Remodeling. Our new kitchen has transformed the house and changed our lives. Rather than being a room through which we ushered guests as quickly as possible, the kitchen is now a focal point of our home. Thanks once again for your fine workmanship. 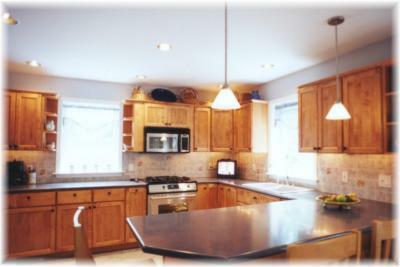 We look forward to the opportunity to work with you again and would highly recommend Absolute Remodeling to anyone." Tim & Karen Lenane, Yorktown, NY. 07/21/00.